Ben James was born into what he describes as "The Family Business" - his mother and father were performing gospel singers, and as a child Ben became used to performing regularly in front of an audience, along with his 3 other siblings. During these formative years, he learned how to sing, harmonize, play drums, piano, and guitar. He recorded his first album as a teenager, singing and playing guitar with his sister. It was this experience that pushed him to pursue music on a more professional level. During this time he began playing music with a friend from church, and together they formed a band called Threefold. In 2001, Threefold embarked on its first tour; the band would subsequently travel across the United States over the next 5 years and record 7 studio albums in Nashville before disbanding in 2006. Upon returning to Washington, Ben began playing djembe, acoustic guitar and singing with various local musicians, including Dan Purser and The Side Project. During this time he met Jason Edwards and Aaron Hiebert, and Shaggy Sweet was born! When he's not playing music with Shaggy Sweet, Ben and his wife Genevieve enjoy spending time with their 3 dogs and 1 cat - all rescues. They are currently involved in supporting Second Chance Dogs, a rescue organization that finds foster and then forever homes for homeless, abused and neglected dogs in need of essential love and care. Aaron Hiebert's musical journey started at the age of 10, playing clarinet in school band. When he was 12 years old, a guitar on display at a music store caught his attention, and his parents supported the switch. Aaron credits his father with seeding his inspiration for starting to play guitar; he recalls many car rides with him listening to AC/DC on the stereo. His dad took him to his first concert, AC/DC in 1996 and from there he was hooked on Rock N' Roll! Aside from AC/DC, Aaron draws much of his inspiration from legendary blues guitar players Stevie Ray Vaughn and Jimi Hendrix. He says Stevie Ray Vaughn's versions of Little Wing and Voodoo Child were the catalyst for him to play the blues, and even after many years of playing, he still finds inspiration every time he listens to it. 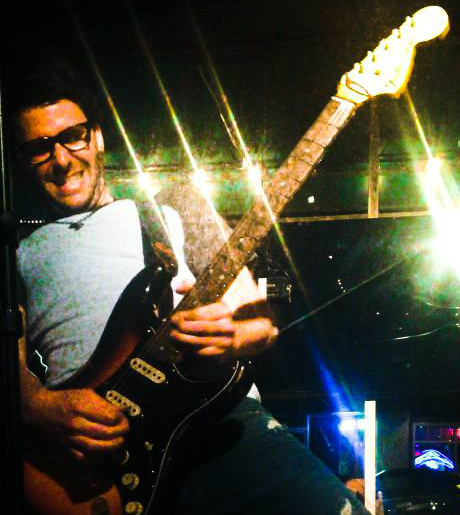 Playing in Shaggy Sweet allows Aaron to stretch his blues chops to the fullest, often to cheers from the audience. Aaron has been playing with bassist Josiah Bogle and drummer Jason Edwards since 2000, and with singer Ben James since 2010. One might think that playing with the same people for a lengthy time period might become stale musically, but Aaron says it's the constant evolution of the songs that keeps the music fresh - every night the music renews itself by going in a different direction. In addition to playing guitar in Shaggy Sweet, Aaron is a car enthusiast, and whenever he can he and his father take their hot rods to track days to race together. Josiah Bogle jumped headfirst into playing music at 13. He had a paper route at the time, and saved the money he made until he was able to purchase an electric guitar and amp. He says the motivation came from singing; ever since he was a child, he had always been passionate about singing. He saw the guitar as a vehicle to perform all of his favorite songs, as well as compose original songs. Josiah's earliest musical inspiration came as child, when he recalls being fascinated listening to an Elton John compilation CD that his father used to play. Elton's blend of Rock, Blues/Gospel & Pop on songs like Take Me to the Pilot, Burn Down the Mission, Rocket Man & Honky Cat really struck a chord with Josiah, and he says they're still some of his all-time favorite songs. Later on he purchased his first album, The Beatles' Please Please Me, and immediately Paul McCartney became one of his musical heroes, both as a singer/songwriter and bass player. Other majorly influential artists for him are Michael Jackson, Tom Petty, Sting, Stevie Wonder & Freddie Mercury. Josiah's love of eclectic musical styles can be seen in Shaggy Sweet's live shows. The band performs a wide range including blues, rock, pop, R&B, reggae, and country. 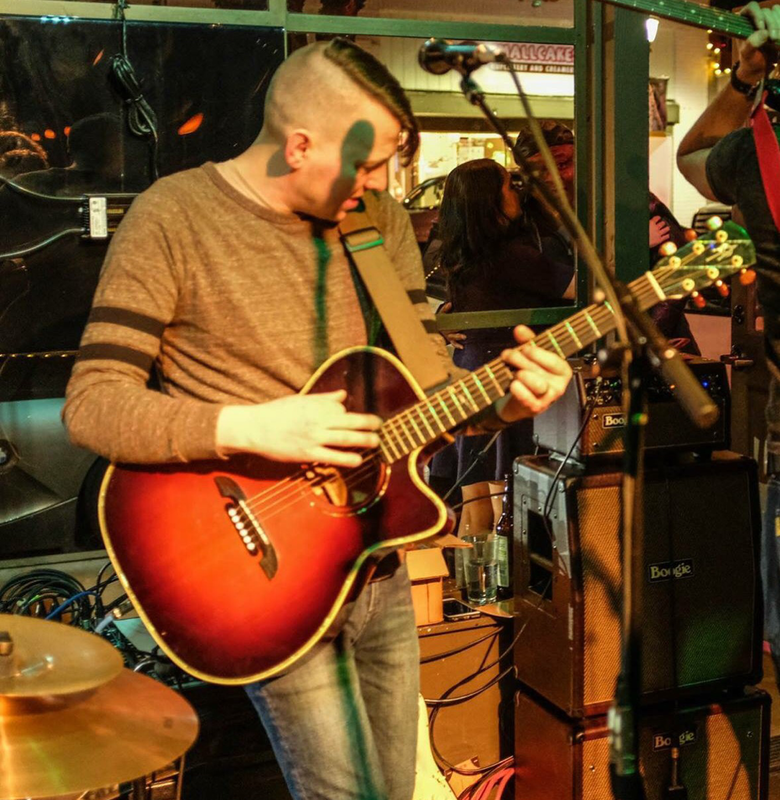 The variety of musical styles performed in Shaggy Sweet is one of Josiah's favorite aspects about the group, and he cites it as what keeps things fresh and fun. Aside from playing music, Josiah is a movie buff, and enjoys watching many new released films and TV series. He playfully jokes that if anyone needs to know useless trivia about Star Wars or Batman, he's your guy. ​Jason Edwards held drumsticks for the first time at age 15. Prompted by a 9th grade school project to learn a new skill over the next three months, then write a report on it, Jason found himself at a local music store taking a drum lesson. He quickly discovered a dormant passion for music and drumming that altered his life's direction. One year later Jason met Aaron Hiebert and Josiah Bogle at a high school Battle of the Bands, and the three started playing music together. The highlight for Jason when playing with Shaggy Sweet is the connectedness he feels with his bandmates. There are times during a performance, he says, that he gets so into what the band is improvising on, that he forgets there is an audience watching. He's grateful that they don't feel left out! In addition to drumming for Shaggy Sweet, Jason records and mixes music at his home studio. He has recorded Shaggy Sweet's three original EP's. 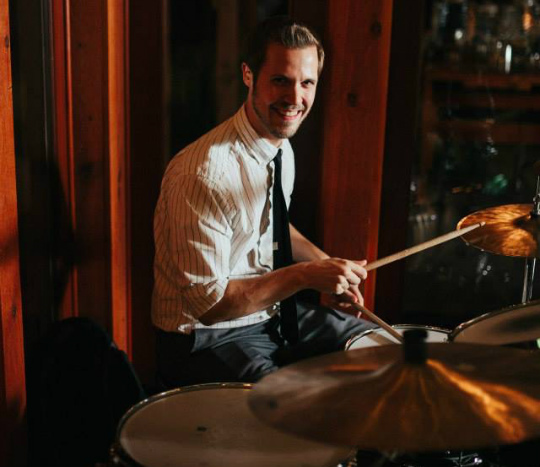 Jason also teaches drum lessons, both at his home studio and a studio in Issaquah.